Let’s not die for this. I always cringe when people say it’s “to die for,” because even the most decadent chocolate cake, eaten in moderation for special occasions, will not be the death of us. I do believe that loyal Ayurvedic followers deserve an occasional indulgence that’s outside the norm of traditional Ayurveda. Yay for the “special occasions rule a term I employed for my personal indulgences many years ago, long before Michael Pollan wrote Food Rules. And, as he puts it, “There is nothing wrong with special occasion foods, as long as every day is not a special occasion.” So, with this caveat, I offer you permission to embrace Valentine’s Day as a special occasion, an excuse to indulge in a decadent chocolate treat—of modest proportion, of course! One note: I avoid white sugar at all cost, so I use unrefined sugars in the cake. I grind coconut sugar and maple sugar in a Vitamix to make a powdered sugar that is also unrefined. This takes about 10 extra minutes, and it also costs much more than standard confectioner’s sugar. I offer this option for purists, but I won’t quibble if you choose to use the less expensive, ready-made confectioner’s option for your special occasion treat. If you’re looking for even simpler chocolate excesses to bake at the last minute, you’ll also love these fudgy brownies, and you can never go wrong with OMG Oatmeal Chocolate Chip Cookies. But for the baker who loves baking a cake from scratch, this Vegan Chocolate Cake is easy enough. Happy Valentine’s Day, dear ones! BAKER’S TIP: Bake the heart-shaped cake in a 9-inch springform pan for 53 to 55 minutes, or you can pour the batter into two 9-inch round pans and bake them for 32 to 35 minutes. 1. Adjust the oven rack to the lower-middle position and preheat the oven to 350°F. Lightly grease one or two cake pans (see Baker’s Tip) with a little oil, and cover the bottom of the pan(s) with parchment paper and grease the top of the paper. Lightly flour the pan(s) and invert the pan(s) to tap out excess flour. 2. In a medium-sized mixing bowl whisk the flours with the cocoa powder, baking powder, baking soda, xanthan gum, salt, and psyllium husk. 3. In a separate mixing bowl, large, combine the coconut sugar with the oil, and beat it for a minute with an electric mixer on medium speed to add some air. Add the vanilla and mix briefly. Slowly add flour mixture, a little at a time, alternating with the almond milk, and mix on low speed until all the ingredients are well combined and the batter is smooth. If the batter seems a little thick, add up to 2 more tablespoons of almond milk. 4. Pour the batter into the prepared baking pan(s) and bake according to the directions in the Baker’s Tip, or until a toothpick inserted in the middle comes out clean or has a few crumbs. You don’t want to overbake, as that would make the cake dry. Remove the pan(s) from the oven and place on a wire rack, allowing the cake to remain in the pan(s) until completely cool, at least 90 minutes. Once the cake has cooled, run a knife along the pan’s edge to loosen the cake. Invert the cake onto a plate, and remove the parchment. 5. 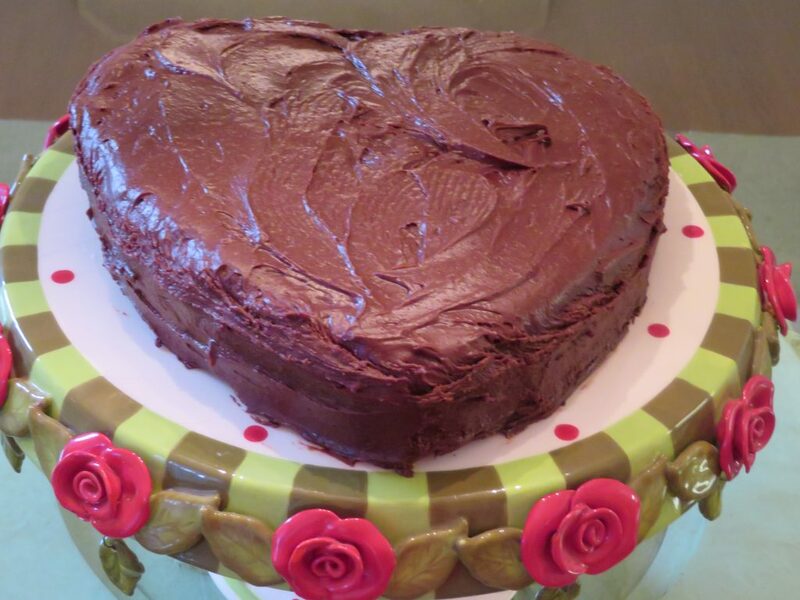 Finish the cake with Dark Chocolate Vegan Frosting (recipes below). You can cover the cake with plastic and frost the next day, but do not refrigerate. It will keep at room temperature for three days. If you wish, use standard confectioner’s sugar. For those who prefer unrefined sugars, I suggest powdering them with a Vitamix. * Substitute 2½ cups standard confectioner’s sugar for the coconut and maple sugar, if preferred. COOK’S TIP: Three cups of these unrefined sugars will become about 2½ cups once powdered. Most store-bought cakes have frosting that is far too sweet for my taste, but if you like that model of sweetness, you will want to increase the amount of sugar called for in my recipe: start with 3 cups standard confectioner’s sugar or a total of 3½ cups of unrefined sugars before processing them. 1. Slowly heat the coconut oil and chocolate in an uncovered double boiler on medium heat, or use a small saucepan on low heat, stirring constantly, until the chocolate melts completely. Then remove the insert pan from the double boiler or remove the saucepan from the heat source. 2. While the chocolate mixture cools, briefly process the coconut sugar and maple sugar in the Vitamix. 3. Place the sugars in a mixing bowl. Add the salt, almond milk or coconut cream, and vanilla. Beat with an electric mixer until well blended. Pour the chocolate mixture over the almond milk mixture and beat well until creamy and spreadable. Add 2 tablespoons additional almond milk, and more if necessary.